The Winfield Fire Department hosted a County wide department extraction practise on May 2nd. Attended by 30 volunteer firefighters from the County of Wetaskiwn, which includes Buck Lake, Alder Flats, Millet, Wetaskiwin, South Pigeon Lake and Winfield. Breton was also invited as they often assist on calls in the area. Winfield’s Fire Chief Barry Clarkson had 5 different vehicle extraction scenarios to set up for firefighters to rotate through. The different extraction scenarios are important as firefighters never know what to expect when called out to a scene. Each group was made up of a mix of members from different departments and experience levels. Mike Zajac, Director of Emergency Services for the County of Wetaskiwin attended the training session. He also stresses the importance of the inter department training. 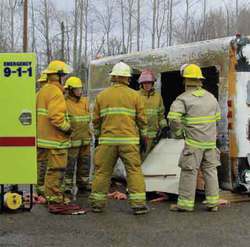 “We have 120 firefighters county wide who are often assisting each other on calls, if they know each other and have worked together before it makes it that much easier.” Wetaskiwin County covers an area approximately 140 kms end to end. Ryan O Meara from Stars was on hand to provide training to the volunteer firefighters on the procedures involved in landing the Stars helicopter. Setting up a landing zone and guiding the helicopter is a crucial part of a firefighters training. All departments in Wetaskiwin County on average hold 2 training sessions per month.